If you’re absolutely honest with yourself, you have to admit to those times—those frequent times—when you feel useless to God. You feel spiritually weak, powerless—as though your desire to do great things for God and your ability to do anything for Him are light-years apart. We’ve all been there. In fact, most of us live there. he offers you timeless biblical truth about the divine resources you have immediate and unlimited access to. 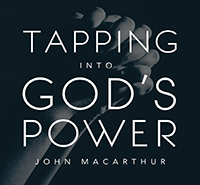 Exploring five steps to turning on spiritual power in your life, this study is one you will turn to again and again.